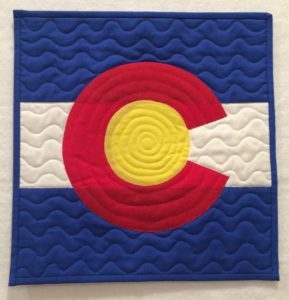 I don’t know about you, but I LOVE quilts about Colorado. 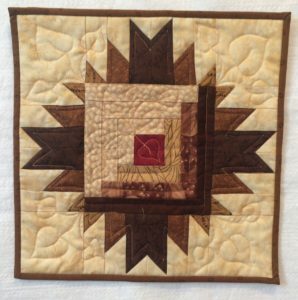 It seems to be a major theme in my quilt making whether it is blocks with names that represent Colorado (Log Cabin, Mesa Verde, Delectable Mountains, Rocky Mountain Road, Bear Paw) or quilts with appliqued objects of Bears, Elk, Pine Trees etc. This past month I have had a chance to make three new little quilts for Wooden Spools that shine and show my love for our state. The first one is of course to celebrate our Broncos football team. It is made with the Primitive Gatherings Pinwheel template. I love the team spirit in orange and blue. It loo ks great on an Ackfeld wire stand (which you can also find at Wooden Spools). They are perfect for holding a 12” quilt. 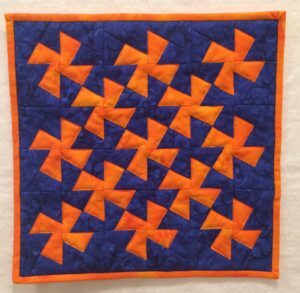 It makes up quickly and it’s a perfect rack to use to change quilts for different seasons. The next one I made is a slightly modified CO Flag. I hang this one with pride for our state. I also love the colors. For me they sing a colorful song (I can almost hear John Denver singing “Rocky Mountain High”). Ok, now I know I am just getting corny but I have one more little quilt to share with you. This last one is called CO Cabin in the Mountains. It can be made like this one to the right with the traditional Log Cabin center surrounded by Delectable Mountain blocks or with a variation of the Log Cabin – called Courthouse Steps – for a more symmetrical look (to the left). Either way it makes a nice addition for fall. And if you want a little variety, you can just add a few more delectable mountains and turn it into a placemat (13” x 19”). ← T is for Twist and Spin…and Thread!